Writer-director Derek Cianfrance's follow-up to Blue Valentine is a beautifully shot, emotionally engaging smalltown crime drama with a pair of terrific performances from Ryan Gosling and Bradley Cooper, though its lengthy third act doesn't quite achieve the emotional resonance of the first half of the film. Co-written and directed by Derek Cianfrance, The Place Beyond the Pines (a translation of the Indian word Schenectady, where the film is set) stars Ryan Gosling as carnival stunt rider Handsome Luke, who discovers he has a son with waitress Romina (Eva Mendes) from when the carnival was in town the previous year. Though Romina has a new man in her life, Luke decides to try and win her back and teams up with shifty mechanic Robin (Ben Mendelsohn) to rob banks in order to provide for his child. However, after a bungled robbery, Luke crosses paths with ambitious uniform cop Avery (Bradley Cooper), with devastating consequences, the repercussions of which bring Avery (who has a wife and kid of his own) into conflict with Deluca (Ray Liotta), head of a group of corrupt cops. And fifteen years later, Avery and Luke's now-grown sons Jason (Dane DeHaan) and AJ (Emory Cohen) are drawn into a conflict of their own, unaware of the connection between their fathers. The film is beautifully shot throughout and Cianfrance's direction is extremely impressive, particularly in the first half of the film, which opens with a wonderful Dardennes-style single tracking-shot sequence that introduces Luke as he prepares for a cage-riding stunt. Thereafter, the film is effectively split into three parts, with an audacious point-of-view switchover from Gosling's character to Cooper's character occurring at around the 40 minute mark; this is a breathtaking moment that carries you willingly through the second part of the film, though the effect is curtailed by a brutal ‘Fifteen Years Later’ jump before the third part. Gosling is terrific as Luke, generating palpable chemistry with Mendes and imbuing his character with an aching sadness that is genuinely moving. Cooper has a tougher job with a less sympathetic part, but he delivers a strong, engaging performance, while there's superb support from Mendes, Mendelsohn and Liotta (Rose Byrne, as Avery's wife, by contrast, doesn't get much of a look-in). The problem with the film is that, after a superb first act and a compelling second act, the final third lands in the hands of DeHaan and Cohen and neither actor is capable of engendering the same level of emotional investment. Cianfrance has stated that he intended the final third to be the film's true story, but that more or less backfires, at least in terms of the audience's sympathy for and involvement with the characters. 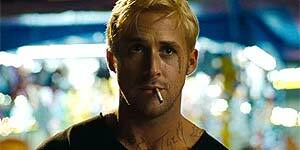 The Place Beyond The Pines is an impressively made, beautifully shot drama with superb performances from Gosling and Cooper, but the second part of the film fails to match the powerful emotion of the first half.